An oil on board painting by Wayne Thiebaud (Am., b. 1920) titled Lollipop Tree, a lovely art glass vase by Ercole Barovier (It., 1888-1974), and a truly fine collection of Victorian furniture are all part of Nadeau’s Auction Gallery’s Jan; 1 sale. Oil on board painting by Wayne Thiebaud (Am., b. 1920), titled Lollipop Tree. WINDSOR, Conn. – Dec. 12, 2017 – PRLog — An oil on board painting by Wayne Thiebaud (Am., b. 1920) titled Lollipop Tree, a lovely art glass vase by Ercole Barovier (It., 1888-1974), and one of the finest collections of Victorian furniture ever offered at auction are just part of what bidders can expect at Nadeau’s Auction Gallery’s annual New Year’s Day auction on Monday, January 1st, at 11 am Eastern. Over 700 quality lots will come under the gavel, online and in Nadeau’s gallery located at 25 Meadow Road in Windsor. For those unable to attend in person, online bidding will be provided by LiveAuctioneers.com, Bidsquare.com and Invaluable.com. Telephone and absentee (or left) bids will also be accepted. Previews will be held daily, from Dec. 27th-30th, or by appointment. A preview will also be held on auction day, January 1st, from 9 am until the first gavel falls at 11 am. That’s when eager bidders will begin vying for the many treasures that can be viewed now, online, on the abovenamed bidding platform sites, as well as at www.NadeausAuction.com. Most of the merchandise has been pulled from quality estates and collections in the region. The expected top lot of the sale is the Thiebaud oil on board under glass titled Lollipop Tree, created in 1969. The colorful and whimsical painting, measuring 13 inches by 10 ¼ inches, is signed and dated in pencil by the artist, bottom center, and has an Allen Stone Galleries, Inc. label on verso (where it was exhibited in 1970). The painting should bring $400,000-$800,000. 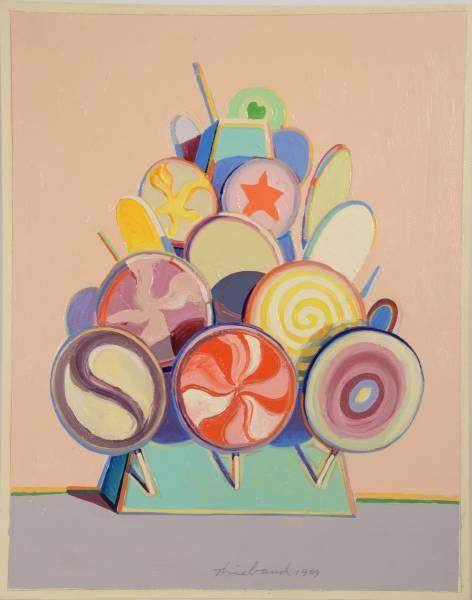 Wayne wfv Thiebaud is a pop artist widely known for his colorful works depicting everyday objects, such as pies, lipstick, paint cans, ice cream cones, pastries and hot dogs. But he’s also renowned for his landscapes and figural paintings. He uses heavy pigment and exaggerated colors to depict his subjects, and the well-defined shadows characteristic of advertisements are usually evident. The vaso mosaico (mosaic vase) executed by the noted Italian entrepreneur and designer Ercole Barovier carries a pre-sale estimate of $30,000-$50,000. The 9 ½ inch tall vase, from circa 1925, consists of clear glass with a mosaic pattern of clear, cobalt, amethyst and emerald, and a rim with gold inclusions. A little roughness at the rim is not expected to dampen bidder enthusiasm. Ercole Barovier was the son of Benvenuto Barovier, one of the most important glass furnace owners of the late 19th and early 20th century. Ercole made his mark very early on, inventing numerous decorative techniques that contributed significantly to the renovation of art glass. He came up with no fewer than 25,000 designs, and his works can be seen in museums worldwide. The fine selection of Victorian furnishings comes from the estate of Frank Perotti, led by a pair of Renaissance Revival walnut and burl walnut cabinets, 75 inches tall, with pierce carved tops over bronze panels over shaped marble tops (est. $6,000-$12,000). Also featured is a fine group of Louis XV and continental pieces (several of them signed) and some Margolis furniture pieces. The furniture category also includes two late Louis XV Charles Topino marquetry bonheurs du jour (small, delicate French writing tables with raised backs). The pieces, both circa 1765, will be offered as individual lots. Both are ormolu mounted tables made from several woods. One is stamped Charles Topino (est. $20,000-$40,000); the other is unstamped (est. $15,000-$25,000). Fine estate jewelry will be highlighted by a Tiffany & Company ladies’ diamond engagement ring, set with a center Asscher cut diamond weighing 4.58 carats. It is flanked by baguette cut diamonds. The circa 1930 ring, with color G and clarity VS1, should sell for $80,000-$120,000. Two very different lots have identical estimates of $15,000-$25,000. One is a beautiful Tiffany Studios Daffodil table lamp having a leaded Favrile 20-inch glass shade with cascading daffodils on a bronze base, marked Tiffany. The other is a 40 inch by 28 inch oil on canvas painting by Virginie Demont-Breton (Fr., 1859-1935), titled Mother and Child in the Garden, artist signed. The auction will also feature fine decorative accessories, to include Louis Vuitton, four large Picasso ceramics, Baccarat, blackamoors, clocks, silver, Oriental rugs and many other fine items. Also offered will be Part XXIV of Credit Suisse’s Americana collection. Part 1 was held in Nov. 2015 and since then the balance of the collection has been progressively offered in more than 20 subsequent sales leading up to the New Year’s Day event. Credit Suisse’s Americana collection was formerly housed at the firm’s opulent U.S. headquarters on Madison Avenue in New York. Nadeau’s Auction Gallery is always accepting quality consignments for its sales, held throughout the year. To consign an item or a collection, you may call them at (860) 246-2444, or you can e-mail them at info@nadeausauction.com. For more information about Nadeau’s big upcoming annual New Year’s Day auction slated for Monday, January 1st, visit www.NadeausAuction.com.